Not long ago, a news article reported on a conference to support those of us who must live without gluten. 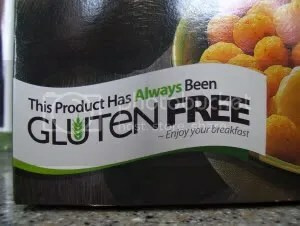 In a food world dominated by gluten products, lord knows we need support, as well as information on all the new gluten-free products coming to market. One aspect of this gathering gave me cause for concern, however: the celebration of newly created substances that better mimic white bread products. The news report quoted one of the speakers gushing over new white flour substitutes–things that had a lot of “modified,” “refined,” and “white” in their names. These modern miracles, she bubbled, could make soft, tender baked goods, just like white flour. But does this miss the point? Sure, we’re getting the technical part of the gluten free diet by eliminating the specific protein called gluten. But are we missing the bigger call to action: Eating a more healthful, whole, vividly varied diet. No need to cultivate a taste for other grains and whole grains. No need to expand our food horizons to include lentils, leeks, Bosc pears, eggplant, cashews, tofu and the myriad other non-gluten vegetables, nuts, fruits, meats and oils in the food kingdom. No need to give pause and question the quality of our meals, the sources of our food and the sanity of our eating lives. Just substitute white, gluten free pizza, bagels, French bread and cookies for their white gluten cousins. So what’s the problem? Why ruin the party? Because there’s so much to be gained from moments of crisis! And believe it or not, moments of dietary crisis are as valuable as near-death experiences, divorces and job losses for propelling us off dead center and on to the better lives we deserve. It’s a widely and well-known fact that we are killing ourselves at the dinner table, and this despite the fact that we come in contact with healthy eating information on a daily basis. It’s an ironic joke among healthy eating professionals that there’s only one sure way a client will make serious dietary change: by having a heart attack. What if gluten problems are meant as teachable moments not just a medical diagnosis? Gluten intolerance could be a life-changing catalyst, rather than just an inconvenience to be worked around as expeditiously as possible. Boring Alert I would never have guessed we were so boring—from a culinary standpoint. Fully 75 percent of our diet involved some combination of white flour and cheese or milk: Grilled cheese sandwiches, pizza, PB&Js, mac ‘n cheese, pasta & more pasta, pancakes, quesadillas, burritos . . . need I say more? While I was astounded at our monotony, my body was astounded at all the nutrients we had missed out on with such a limited food intake. What’s a Whole Grain? Nor could I believe how ignorant I was. Despite 21 years of schooling, I didn’t know what a whole grain from a peanut, why whole grains are important, that wheat is just one grain, that wheat is in practically everything we eat, and that there are lots of other grains that millions of people eat in other parts of the world. When I was growing up, Wonder Bread and Twinkies were the extent of our exposure to grains. Now I know that dietary knowledge is power—power to shape and direct my health. Cheers to the Colorful Plate Forced out of my comfortable bread and cheese cocoon, my taste buds were stretched to the breaking point. But they were a lot tougher than I could have guessed. Polenta, bok choy, papaya, cannellini, lamb, buckwheat, kale and dozens of other strange-sounding foods became fast friends, adding color, flavor and delight to our meals. No Picky Eaters Here Not only did my taste buds rise to the gluten free challenge. My kids’ taste buds did, too. As they got older, I never had to short-order cook, I could be as creative as I wanted, we could go out to interesting restaurants, and even to this day, our kids treasure family meal times, wholesomely interesting dishes and vegetable-rich meals. So in a crazy way, it was good we weren’t able to simply swap white for white. We were forced to take advantage of a big learnable moment, and instead of just simple substitution we got a complete gastronomic transformation! Meal making is now an adventure. Eating and wellness are intimately integrated. New foods and cooking techniques continually beckon and keep life interesting. And as we learn more about strengthening our diet, we learn how to eat in a way that feels more right environmentally and socially. Hooray for teachable moments, even if inconvenient.